So the question remains: what does one person do with two loaves of sourdough bread? Make soup? Yup, I would have never gone that route. Makes sense though. See, bread soups are a staple of cultures all over the world–French, Italian, even Arab cultures all make soups that incorporate bread into the soup itself, not just as something to sop the soup up with. Speaking of which, “soup” literally comes from the Latin suppa meaning “bread soaked in broth.” Coincidence that bread would taste good in soup, then? I think not. This easy to throw together, hearty winter soup comes from Yotam Ottolenghi’s newest book, Jerusalem, which I, embarrassingly enough, have not yet bought a copy of. In fact, I don’t own any of Ottolenghi’s books. A total travesty since I consider him to be a genius at approaching vegetarian cuisine from a global perspective. And Nopi in London? Oh yes, a highlight of last year’s trip to England and Paris. While I haven’t cracked open the pages of the cookbook, plenty of bloggers have, including Jillian over at I Heart Food, and if all the recipes are as good as this soup, then I really need to get on purchasing a copy. The soup is just that good. Which is why you should make it too. It’s super easy to throw together on a week night and uses up standard pantry staples like canned/boxed tomatoes, onions, and bread. It also makes a ton–so if you’re looking for leftovers, this recipe is for you. I’ve given it here with a few changes, but feel free to go back to the original recipe or play with it on your own. Who knows what fantastic flavor combinations you might end up with? If you land on something smart, be sure to let me know what it is so I can give it a whirl! Heat the oil in a stockpot or dutch oven. Add the onion and cook for about 5 minutes until the onion is translucent. Add the cumin, aleppo pepper, salt, and pepper, and cook for 30 seconds, until fragrant. Add the crushed garlic and cook for 1 minute, stirring a few times. Pour in the vegetable stock, tomatoes, and sugar. Bring the soup to a simmer and cook for 20 minutes, adding the torn bread halfway through the cooking. Use an immersion blender to break down the tomatoes a little, you want the soup to be fairly chunky so don’t blend it completely. If you don’t have an immersion blender, transfer half the soup to a blender and pulse a few times. Then add it back to the pot and stir well to combine. Garnish with a crouton or flavored olive oil of your choice. Um, no, I think a grilled cheese is required. Wish I’d thought of that!! Beautiful looking color! and it looks so hearty. Since it makes a ton, can you freeze some of it? I definitely think you could freeze it. Mmm, soup for now AND for later. That soup looks gorgeous and sounds wonderful. I would kill for a bowl right now. Hooray for soup! I love the idea of using stale bread like this–especially since it clearly makes the soup more substantial & filling. And sourdoughy! I got a copy of Jerusalem for holidays but haven’t made anything from it yet…must get on that. You always come up with the best solutions! I’ve seen plenty of bread-based soups before, but they always strike me as doughy vegetable mush. This, on the other hand, looks like the perfect balance of flavors, with the satisfying tang and heft of sourdough to keep it grounded. Yum! 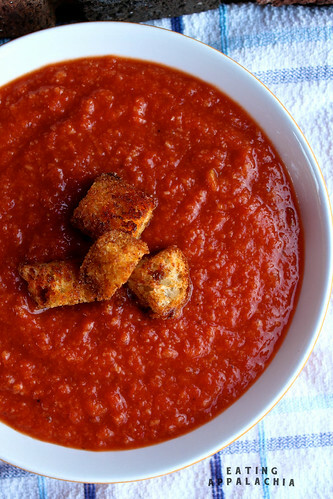 Tomato soup is one of my favorites, and although I’ve made lots of bread soups before, I’ve never thought to puree the bread into the soup like that – it’s always been hunks of bread in soup.